I love to release new patterns and this one tops the cake! 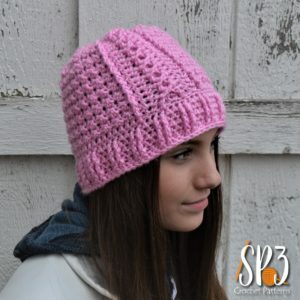 The Slalom Slopes Beanie is a beautiful hat design with so much texture that you are sure to love it. I designs this hat for a dear friend of mine, who’s daughter was just diagnosed with Breast Cancer, at age 18. I was really trying to make a hat that was stylish for the young, warm, and full of texture. 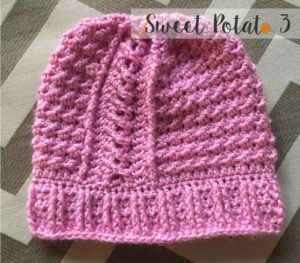 The Slalom Slope Beanie crochet pattern was made in sizes: Toddler, Child, Youth/Ladies and Adult/Men. 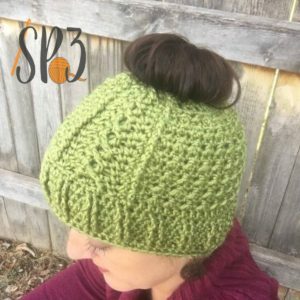 Add a cute pom for that added spark of character to its look or make it in a messy bun style (instructions included in the pattern). The beautiful twisting cables reminds me of that first run on the ski hill in the morning. The joy the first run of the morning brings is so amazing. I hope this hat will warm your heart just like that first run warms your spirit! For a LIMITED time, get the Slalom Slopes Beanie for 50% off, on Ravelry only, through Tuesday December 12, 2017. You must use code “SLALOM” at checkout. If you enjoy seeing sneak peaks, receiving great discounts, being inspired by others crochet projects, want to share you crochet projects and progress, please come and join my Crochet and Conversation Group on facebook. I hope to see you in there!